The study also shows that, while the presence of women on monetary policy committees has increased over the last decade, the average share of women remains low at 14%. Using data from central bank monetary policy committees for 103 countries between 2002-2016, the authors show that women adopt a more hawkish approach to monetary policy. 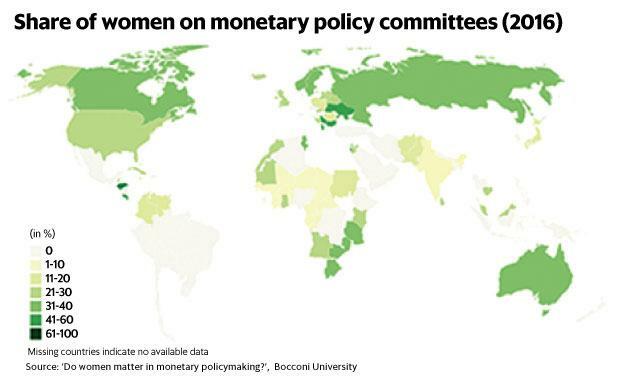 Monetary policy committees with a higher proportion of women set higher interest rates for the same level of inflation. The study also shows that, while the presence of women on monetary policy committees has increased over the last decade, the average share of women remains low at 14%. Currently, there is only one woman in RBI’s six-person monetary policy committee which was established in 2016 to focus exclusively on monetary policy.